Life's been great at the moment, in fact i have never feel so alive. It was been hell of a week in the mid of november. Imagine piles of school work, interning in office hour, events to attend, and another freelance projects. But now, school projects have been submitted and currently focusing on my internship. Spending the rest of the year here, not much holiday but i can still feel the festive season. Thanks so much for stopping by my blog and for your sweet comment. 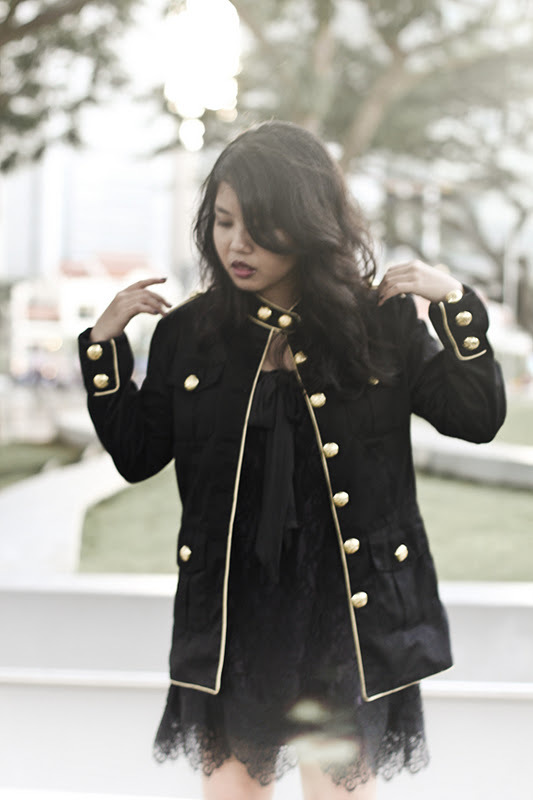 I love your military styled jacket,with those gorgeous gold buttons,super cool and luxe. Love the mix military and lace, so trendy. lovely military jacket, fhenny! so you. the shoes are gorgeous too. Great pictures... love your boots!! you look great in black babe!! ;) missing youuuuuuu the wholla time!! Love a statement making jacket - that one looks fab. Visit Our Flash Website Too,,Printing Machine. That jacket is FABULOUS babe!! Love all the hardware...what a great find! I'm in love with that jacket and boots! oh wow, what a great blog you have, your style is amazinnng! COME follow us we would love u for it! The jacket is really pretty! Love the outfit! P.S. There's a giveaway worth $189+ for an oversized clutch on my blog if you're interested! what a beautiful jacket you have! good luck for the internship! Thank you! I love love love the boots and jacket! you look so stunning my dear! awesome coat! I love black and gold.. I love this gorgeous mix of hard and soft! love the look and every pieces! classy, classic but not boring. the best living in Austria are the clean water and the Alps! In Vienna you can discover different street styles, vintage finds and tons of inpiration sources. But folk costume and country side is so awsome too. Love your jacket! I love the details, it's gorgeous! I'm amazed at what you're achieving at such a young age. I wish I had your foresight and drive to do the same. You look fantastic. Very chic and totally rocking it! That's such a gorgeous coat! ia di bandung makin byk yg bagus loh,ayo kesini . i love the military coat ci fheny! so gorgeous! amazing black outfit i must say. elegant, classy& you look jst amazing. yeah im back already :) hbu? I.Need.This.Jacket. Seriously... it is amazing. Really cool outfit. Love the gold buttons. Thanks for visiting me. and i love the pics... really beautiful. 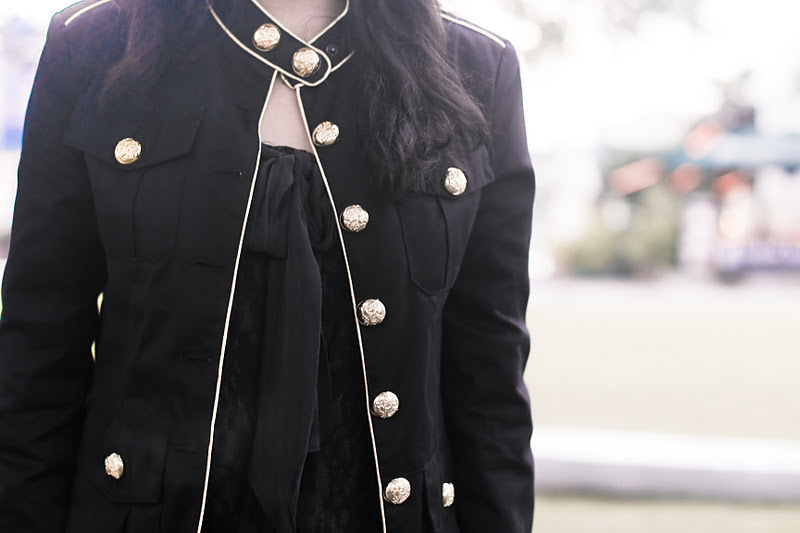 The millitary detailing on the jacket is to die for, and paired with lace.. love your outfit! these pics are gorrrrgeous!thanks for your sweet words and hope u'll come visit me more often! You look gorgeous! I love your blog! I'm ready to see what 2012 has to offer! Love the jacket! you look fab!!! love the look!!! wow! amazing photos! You look awesome!! u are loely my dear! gorgeous jacket. i love anything with big gold buttons! very luxe! What a fantastic jacket. The buttons are so striking and really stand out in all-black! You look gorgeous and I love the jacket on you! Love the mix of your girlie lace dress and the military jacket! Great photos too! you have a really nice blog:) following you, if you want come abd follow me back! I absolutely love this outfit. I love the all black, looks awesome! You're BEAUTIFUL, Fhen! Absolutely stunning. That jacket is absolute perfection, and the photography is gorgeous. I'm so glad life is going well for you - you deserve it! Wow great outfit, that jacket is such a statement piece. This outfit is so stylish and fabulous! You look amazing!